The next best thing next to having a highspeed internet connection and Google in your pocket is having all of Wikipedia!Â Encyclopodia is Wikipedia has been ported to iPod Linux!Â The nice part about putting Linux on your iPod is that should you want to experiment you can destroy the software on your iPod trying to install Linux and just use Apple’s iPod firmware updater to reset your iPod and sync it back-up with iTunes.Â More about iPod Linux can be found at ipodlinux.org. Formally named DTV and formally only on the Mac, the new version of “Democracy” is ready for both Windows and Mac users. Democracy is a an open source attempt at an internet television. It subscribes to RSS feeds and downloads the enclosed files, stores them and allows you to view them. Unlike iTunes, this tool is an excellent way to view video and it supports torrent files for fast downloads and a reduced impact on the provider. The program was created by The Participatory Culture Organization and is largely a tool to watch Democracy Now’s (a political radio show) video feed. The Participatory Culture Organization also makes The Broadcast Machine which takes care of a lot of the work of hosting and producing video podcasts/vidcasts/feed. I’ve been using this application for a while and blogged about it last year. It’s a great way to find entertainment and information and view it on your schedule. Get your copy of Democracy at www.getdemocracy.com/downloads/. I can’t say why, but I’m always concerned with what’s over my shoulder — and it’s not just because it’s bad feng shui to sit facing away from the door. 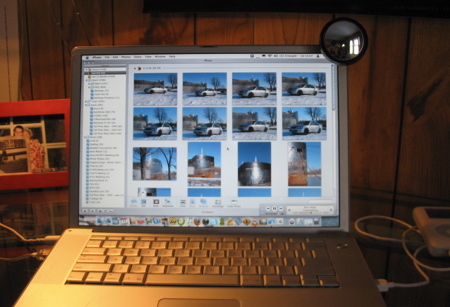 To address this concern I built a simple laptop rearview mirror that will mount on the top of almost all LCD screens. All you need are these two basic parts available from Canadian Tire and many other places. The best part is you’ll have one for each side of your laptop as both components come in pairs. 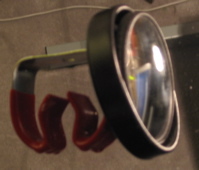 Remove the wax paper from back of one of the mirrors and stick it to the side of the Toolholder. You may want to also remove the screw from the Toolholder (save it for your collection ) The rearview mirror should now clip onto your screen. Feel free to make another one. Want to leave a comment but can’t? Send me a message via the via the “Send a Message ASAP” link found on my home page mattclare.ca. I’ve had enough of ‘bots posting spam as comments on my blog! Today while trying to remove hundreds of items of comment spam I removed at least four comments I really wish I still had. Of course, it was to be a quick job and I didn’t do a backup before hand. It’s not the first time either, I lost all the comments from the Billy Corgan and K-OS concerts because I mistakenly deleted them. Too much comment spam makes the comment section of a blog unreadable and blog comments are important. Blog comments are what keep people blogging about things they know nothing about in check! ….that and there’s a community aspect to it or something. For those of you who don’t have a blog, especially a wordpress blog, you probably aren’t familiar with comment spam — though you may have seen it. Despite all the evidence to the contrary, most people who read blogs don’t leave comments about poker, debut consolidation, and pron. Many do leave comments about how much they like the blog, but they tend not leave links to poker, debut consolidation, and pron with those comments. ‘Bots are what all these comments about poker, debut consolidation, and pron are what are coming from. ‘Bot is short for robot. As I recently explained during an interview for a local paper about this blog, ‘bots are computers programmed to scower the internet for blogs and to post comments with links back to their sites. Comment spam is created to get the word out about their site and to increase the value Google assigns to it. The worst part is it’s very easy to create a ‘bot and one ‘bot can make hundreds of posts a second. Many viruses are designed to turn PCs into Spam ‘bots. This afternoon I watched what I thought was shaping up to be a more mundane opening ceremony than Athens: Opera and ballet and no flying land-forms or giant temporary lakes. But then I heard the greatest thing I’ve heard all week. 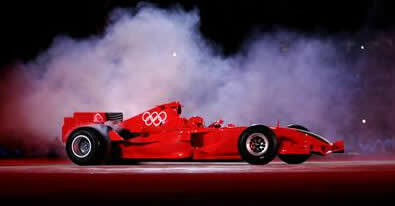 As the modern dancers left the stage out of the floor appeared the Scuderia Ferarri’s pit crew placing tires on an F1 car driven by test driver Luca Badoer. 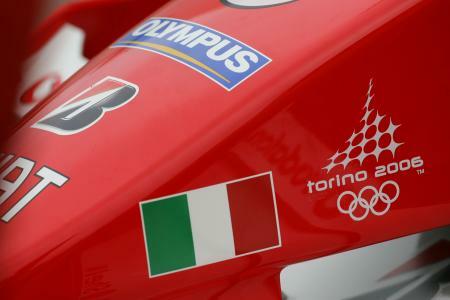 The car appears to be the 2005 F2005 chassis painted in Olympic colours. The team lowered Luca down to the floor and he slowly drove the car out to the main stage, set the brake bias to the front and did a number of screaming doughnuts filling the stadium with sound and smoke. I think the whole segment of the ceremony lasted about a minute, but I was jumping up and down with the TV at full volume for the whole thing. It was capped off with a large fireworks display that ringed the stadium. 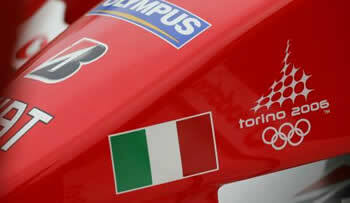 The T in FIAT stands for Torino. FIAT currently own Ferrari which is also based in Italy in Maranello. You are currently browsing the iMatt :: The Blog of Matt Clare weblog archives for February, 2006 .